A week ago this evening, my principal organ teacher, Carl Staplin, died at almost 80 years of age. I studied with him from 1970-1974 when I was an undergraduate student at Drake University, in Des Moines, Iowa. 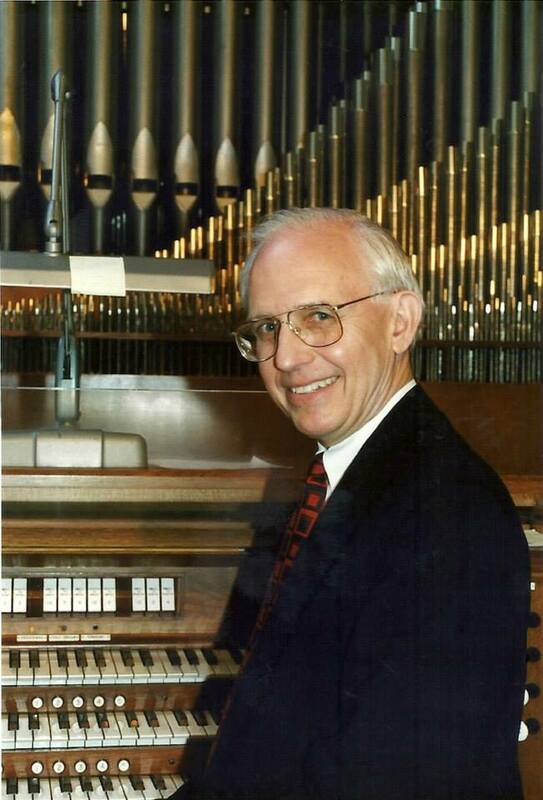 I’ll be making a quick trip to Des Moines tomorrow afternoon, and I will be one of the organists for his memorial service on Monday morning at First Christian Church, where he was the organist for decades, presiding over a 1956 Holtkamp organ of great integrity, if not great size. Indeed, my first church job as a beginning freshman at Drake was as his assistant at First Christian. I had the opportunity week-in-and-week-out to hear him play repertoire, lead hymns (often with dazzling free accompaniments) and accompany the choir, which was conducted at the time by the late Allan Lehl, the director of choruses at Drake. That experience gave me a model to emulate for my 40-year (and ongoing) career that followed. Carl was a brilliant teacher, patient, but insistent. He could always find something encouraging to say, even after the most dismal lesson. I don’t recall ever hearing him utter an unkind word. He had a friendly smile and greeting for everyone. Although all of his students were expected to study masterpieces of the organ repertoire, he also encouraged students to explore the repertoire of interest to him or her. My own senior recital had Bach, Sweelinck, Hugo Distler, the Roger-Ducasse “Pastorale” (What was he thinking!? ), and Ligeti’s “Volumina,” that masterpiece of graphic notation with its use of the organ as non-traditional sound source. I’m sure Carl knew little about the piece when we started, but we plowed through it together. There are probably many teachers with whom I could have studied more repertoire; Carl insisted that things be very well learned over time and usually memorized. The result of that kind of study was that we didn’t necessarily cover lots of pieces but we learned how to listen and learn, a skill that has been my shield for all of my playing career and that has brought me performing opportunities that I might not otherwise have had. Most notoriously, that skill came into use once when I received the invitation in Cleveland with just two weeks notice to perform Jean Langlais’s Messe solennelle at which the composer himself would be present. Although I had heard Langlais’s mass before, I hadn’t played it. All worked out well for the performance. The cadre of organ students at Drake became our ad hoc social group (very few of the students belonged to the Greek organizations that were the hub of social life for many at Drake). The parties at the Staplin home were legendary. Carl’s wife Phyllis, and his two children Elizabeth and Bill, put up with the uproar. Bill was a toddler at the time, and I think he often wanted us just to leave so he could get some sleep. I’ve spent the last week reflecting on Dr. Staplin’s influence on my life and career, and even now I hesitate to publish this, because a few sentences cannot do justice to his life as a musician, academic, personal mentor and friend, husband and father. Rest well, Carl. Your legacy is secure in the lives of your students, family and friends. Next > How many books in a library?